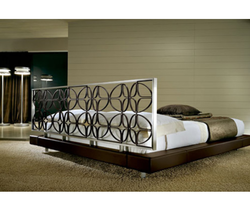 Providing you the best range of stainless steel bed and stainless steel sofa bed with effective & timely delivery. Brushed stainless steel, lacquered aluminum and luxurious leather are used in harmony to create this outstanding contemporary bed. The headboard features a sophisticated design of interwoven shapes – resembling asymmetrical stars and suns – and provides an eye-catching centerpiece for the bedroom. Both the headboard and the leather bed frame are available in a variety of colours, such as an exotic anemone blue or a warming carob red. Enjoy the refined allure and comfort of this iconic bed in your own home. Brushed stainless steel, lacquered aluminium and luxurious leather are used in harmony to create this outstanding contemporary sofa bed. The headboard features a sophisticated design of interwoven shapes – resembling asymmetrical stars and suns – and provides an eye-catching centerpiece for the bedroom. Both the headboard and the leather bed frame are available in a variety of colours, such as an exotic anemone blue or a warming carob red. Enjoy the refined allure and comfort of this iconic sofa bed in your own home.